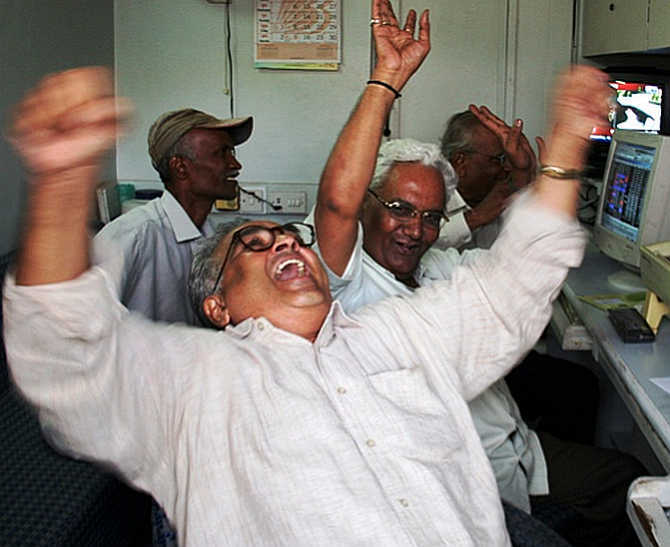 The BSE Sensex shot up by over 128 points to 30,071.61 and the NSE Nifty scaled 9,343.15 -- both lifetime highs -- in opening trade on Wednesday following sustained buying by retail investors amid high foreign fund inflows. Encouraging earnings and positive Asian cues also contributed to the stellar show of the bourses. Besides, the rupee appreciating against the dollar to trade at a near 21-month high of 64.07 fuelled the bull run of the bourses. The 30-share BSE index reclaimed the 30,000-mark to trade at a new record high of 30,071.61 by surging 128.37 points, or 0.42 per cent. This surpassed the previous record high of 30,024.74 (intra-day) that the Sensex touched on March 4, 2015. The gauge had rallied by 577.94 points in previous two sessions. On similar lines, the National Stock Exchange index Nifty continued its bull run by gaining another 36.55 points, or 0.39 per cent, to hit a new high of 9,343.15, breaching its previous (intra-day) high of 9,309.20 touched in Tuesday's trade. All the BSE sectoral indices led by FMCG, metal, bank and IT, were trading in positive zone with gains of up to 0.57 per cent. Shares of Wipro surged 2.36 per cent to Rs 506.20 after the company on Tuesday posted a marginal increase in its consolidated profit at Rs 2,267 crore for the quarter ended March and said it will issue bonus shares within the next two months. Other major gainers that supported the key indices were M&M (1.19 per cent), Axis Bank (1.05 per cent), HDFC Ltd (1.03 per cent), Tata Steel (0.89 per cent) and ITC (0.75 per cent). Brokers said that sentiments remained bullish largely due to a better-than-expected earnings by some blue chip companies so far and foreign fund inflows, apart from a firming tend in global markets with investors awaiting the release of US President Donald Trump's tax reforms later in the day. Among other Asian markets, Hong Kong's Hang Seng was up 0.56 per cent, while Japan's Nikkei rose 0.73 per cent in Wednesday’s early trade. Shanghai Composite Index gained 0.36 per cent. The US Dow Jones Industrial Average ended 1.12 per cent higher in Tuesday's trade. Are markets ripe for a steep correction?